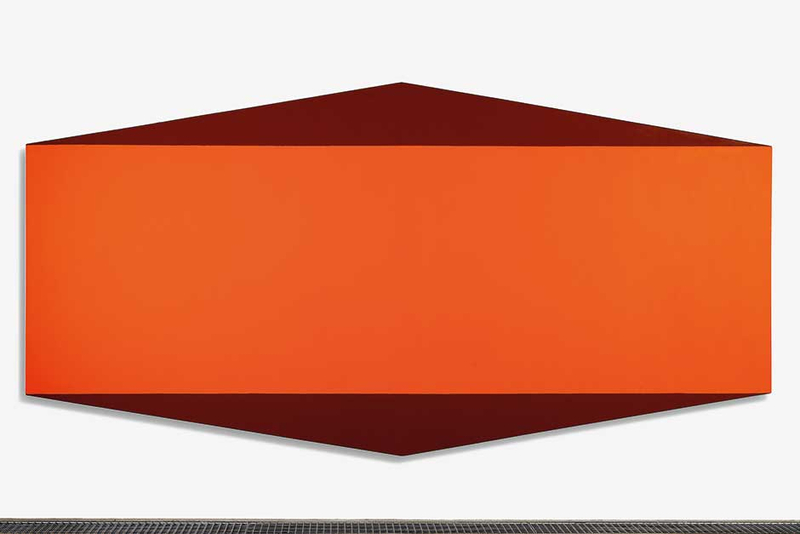 The Jean-Paul Najar Foundation is presenting Olivier Mosset: Abstraction, an exhibition that traces Mosset’s lifelong exploration of geometric abstraction and minimalism through key works from the last five decades as well as new works that are being showcased in public for the first time. Mosset was born in 1944 in Bern, Switzerland and moved to Paris in 1965, where along with artists Daniel Buren, Michel Parmentier and Niele Toroni he founded the minimalist art collective BMPT (named after the initials of their last names). The young artists opposed the avant-garde in France, rejecting expressiveness in favour of practical artistic methods and reduced their paintings to the most basic physical and visual elements through the repetition of simple geometric motifs to create neutrality and autonomy in their work. Mosset’s chosen motif was the circle, and between 1966 and 1974 he made 200 identical paintings featuring a black circle in the centre of a white square canvas. “Mosset was a key figure of geometric abstraction in 1960s France, and BMPT was an important movement that continues to influence contemporary art. The group’s artistic language was a response to a particular moment in France that was defined by social unrest and radical philosophy. It challenged established methods of art making, proposing new social and political functions for art and artists. This show commemorates the 50th anniversary of the BMPT movement’s earliest exhibitions, which they called ‘manifestations’ by presenting some of Mosset’s circle paintings, as well as a rare collection of hand-written notes, catalogues, posters and invitations related to the manifestations,” curator Hervé Mikaeloff says. In 1977, Mosset moved to New York where he became a part of the Radical Painting Group, which like BMPT was interested in returning to the root of painting, and focusing on the media and techniques by which art is made. He began doing monochrome paintings, experimenting with materials such as industrial paints, applied evenly with no trace of the artist’s hand, to focus attention only on pure colour, surface, scale and repetition. Examples in the show include an untitled blue painting from 1981, a set of monochrome silk screen prints, and a work playfully named Six Packs after the takeaway cartons of beverages where the canvas is sprayed with black industrial polyurethane paint to create a shiny, textured monochrome referencing iconic art historical works by Malevich and Rodchenko. Mosset’s monochromes later evolved into geometric shapes and then into constructed paintings, where the canvas itself was in a geometric shape emphasising the status of an artwork as just an object. The show includes a dichromatic hexagon from 1997, and a set of monochromatic crosses and circles from his ‘tic tac toe’ series. The artist currently lives and works in Tucson, Arizona, where he continues his exploration of minimalism and materiality to create autonomous abstract paintings. For his first exhibition in the Middle East, he has created some new works that indicate a return to the rectangular canvas and to deconstructing monochromes. The monumental multi-panel paintings on primed canvas feature blocks of contrasting acrylic colours interspersed with white. 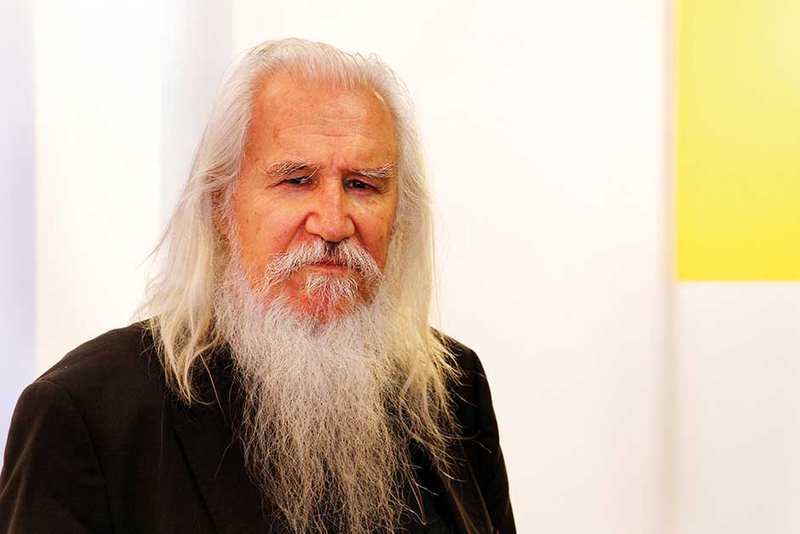 Some have titles such as Cadillac Hotel and Park, perhaps referring to his travels as a biker around Tucson, but they still express his philosophy that a painting is a material existing in space and that the artist’s presence in the work only interrupts the experience of the painting. Mosset was in Dubai for the opening of the show and spoke to the Weekend Review about his life and work. What was the atmosphere in Paris in the 1960s that provoked the BMPT movement? There was a lot happening politically, socially and culturally and as always artists wanted to question everything and discover new things. The art world was also reacting to abstract expressionism and Russian constructivism. For me it was mainly about criticising the idea that the value of a painting is based on the fact that it is unique and has the trace of the artist’s hand. That is why we did repetitive motifs like horizontal or vertical stripes, measured brush strokes or circles. Being detached from the work was part of it. To be honest when I look back I do not really like my paintings, but I am detached from them and look at them as works and not ‘my’ works. I like to do exhibitions because it is a way to see the work in a gallery like any other visitor. What was the idea behind doing 200 identical circle paintings? I was questioning the uniqueness and hence value of a painting if it is replicated 200 times — but by hand. We were asking questions about who a painting belongs to, what it is about, why people want to collect, what is painting, what is not painting and what is outside of painting. Through our simple repetitive paintings, we questioned the system, and also showed it to others. I am still asking those questions and still trying to keep myself away from the work. I want the painting to have its own autonomy. When people look at the painting they should not be looking at me, but at themselves and realise who they are. Is that why you did not sign your paintings, and is it true that you sometimes signed each other’s work? I never signed the circle paintings, but there was a point when the system started noticing us and recognising as our signature the motif each of us was doing repetitively. To break this notion we started signing each other’s work. In fact, Buren and Toroni even asked people who came to our openings to do paintings with their motifs. How do you see your role in minimalism and abstraction? It just happened that we have become part of art history. I always thought that abstraction was a good idea because it does not have to do with representation and is about making an object that did not exist before. When I went to New York, at that time there was a return to figuration and the discourse was about post modernism. So I moved to an even more radical form of abstraction through the monochromes, which other artists were also doing. We came up with the name Radical Painting Group to suggest the idea of going back to the roots of painting and questioning it from the beginning, though it also reflected our political and social views about the world we lived in. It is quite weird that abstraction and minimalism are now part of the mainstream, and I cannot even afford to buy some of my old paintings. What is your advice to young artists of today? Try to do something else, but if you cannot help it then do art. For an artist it is important to go to galleries and museums, to know what your contemporaries are doing, and to understand the system and how the business of art works. Do you feel that today Dubai has the creative energy and environment of Paris in the 1960s? I do not know enough about this city to give my opinion. But the good thing is that today artists do not have to be based in an art centre like Paris or New York; they can work from anywhere and remain connected with everything that is happening, and even reach a huge audience via social media. 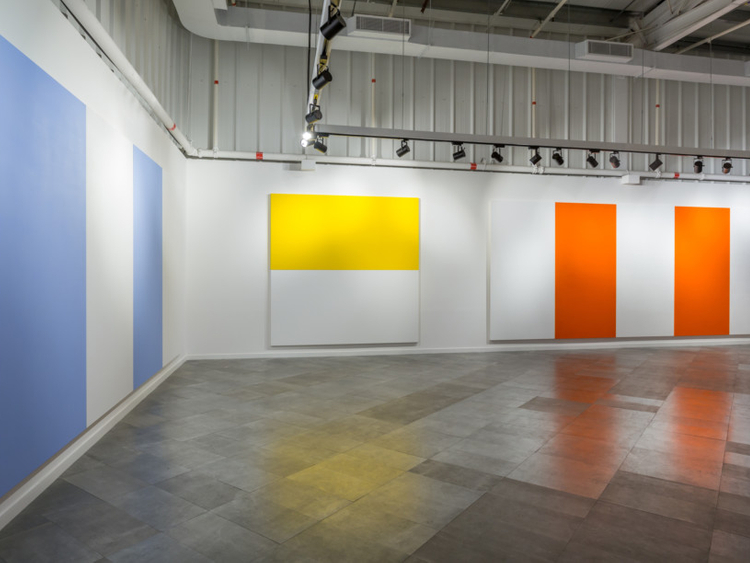 Olivier Mosset: Abstraction will run at the Jean-Paul Najar Foundation, Al Serkal Avenue, Al Quoz until February 28. The show is complemented by a public programme of educational talks and workshops. These include Art Day on January 20, featuring a workshop on Geometry in Sculpture for families, a Radical Painting workshop for adults and a talk on Seeing Through Abstraction. On February 7, a performance titled For the First Time, Something Will Happen will recreate the manifestations staged by BMPT that were a radical critique of art institutions. Other workshops include ‘Art is a Dream’ for children on February 17 and Eyeballing: Olivier Mosset on February 21.